in a sentence or so: Minli searches for the Old Man of the Moon, famous from her father's many stories, so that her family may have good fortune and no longer have to spend their days laboring in the fields. it's a dangerous journey full of stories, adventure, and a dragon who can't fly.Minli lives a meager life with her parents. they have just enough rice to eat and just enough space to live, but that's not enough for Minli's mother. 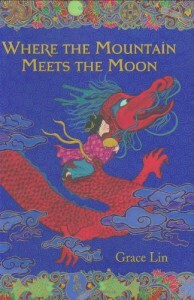 Minli is inspired by her father's many fantastical stories and decides to search out the famed Old Man of the Moon. the Old Man is the only one who can change her family's fortune and give her mother the happiness she deserves. setting out with a few select items (selected for her by a talking goldfish), Minli bravely embarks on an adventure that will change her life. will she find the change she's hoping for, or will a new path be laid before her?i (obviously) love stories. i also love stories within stories, which is what we get with this book. Minli's father kicks off the storytelling by sharing The Story of the Fruitless Mountain to explain why it is that he and Minli's mother must toil all day long. Minli's mother is annoyed by the stories as a way to explain their existence, but what else is there? the art of storytelling comes back again and again in Minli's journey, always to enhance and deepen the running narrative.on the surface, Where the Mountain Meets the Moon is a fantasy journey where a young girl meets interesting characters along her quest. deeper below the surface, however, are messages and food for thought about what makes us happy and how that happiness can be attained.you can't help but adore Minli. she's sweet, brave, and consistently considerate. the other characters along the way add their own spice to the story and help to create an imaginative and thoughtful read.fave quote: "'You know where the Never-Ending Mountain is?' the dragon asked. 'I thought to see the Old Man of the Moon was impossible. You must be very wise to know how to find him. ''Not really,' Minli said. 'I got the directions from a goldfish.'" (48-49)fix er up: i would have liked a little more follow up with the characters along the way.